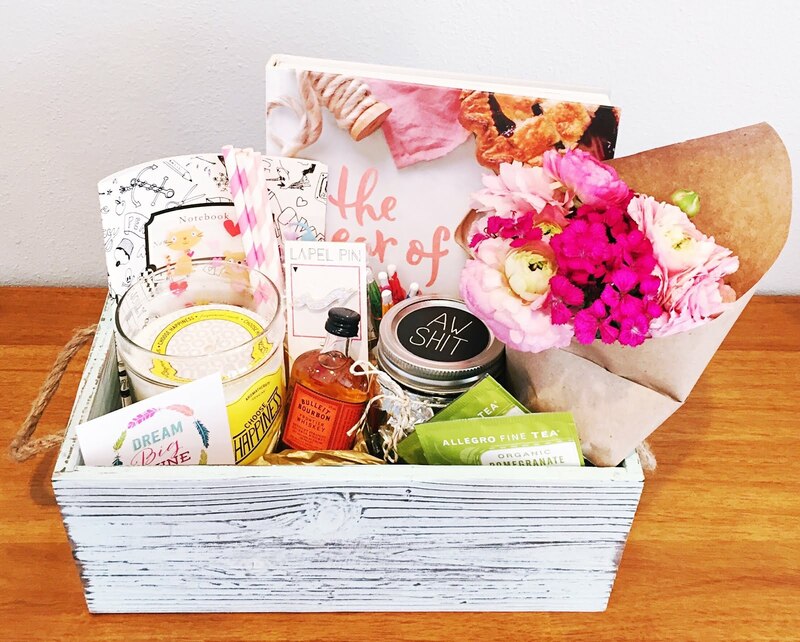 I really wanted to do something fun and sweet for my bestie and what better than a box of things she loves created by you?! Not to mention it's tons of fun finding little things that you know will make her smile and then putting them all together in a cute crate or basket. 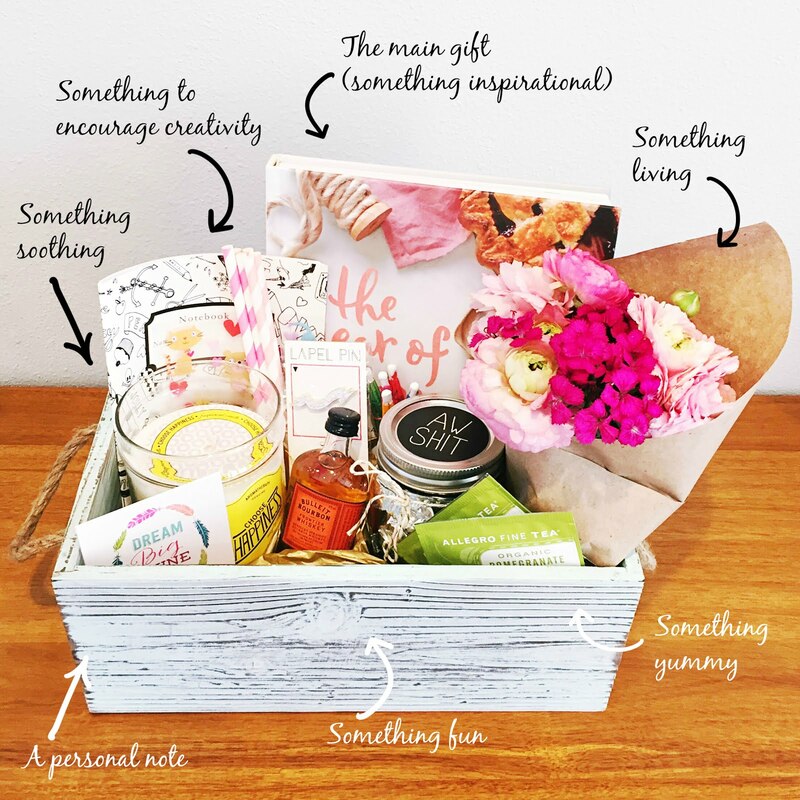 It all started with a super inspirational book that I just couldn't put down and I really wanted to pass it along to her and it just expanded into a basket of goodies to brighten her day. If you haven't read The Year of Cozy by Adrianna Adarme and are in need of an inspirational pick-me-up then this book is a must! I feel like she's my own personal cheerleader, who I've never met, pushing me to be a better version of myself. LOVE her! Now for the rest of the goodies. I like to stick to a few simple rules but really, anything you put in there is gonna be awesome because it came from you! 1. Start building the box with the largest items in the back and work your way forward with the medium pieces and then save the smallest for last to fill the little voids. 2. As you work your way to the smaller items, build up the bottom of the box with tissue paper or hay. You want to be able to see everything and the small stuff can sometimes fall to the bottom and get lost if you don't build them up a bit. 3. Try to avoid leaving any empty spaces. You want your box to look full and not skimpy. Sometimes that means you might have to think of a couple more goodies to add at the last minute but that's cool because there will be more fun stuff for her to enjoy. The best part after all of your hard work is the payoff: the smile on her face when she sifts through everything, noticing all the details and personal touches you added. Happy box building! I'd love to see pics of your creations and the different themes and ideas you come up with! I just love your talent!! Awesome!